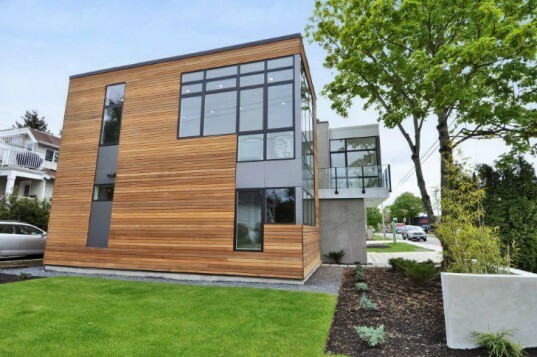 Beachaus I was recently completed in the White Rock East Beach community south of Vancouver in British Columbia. Located 200 meters from Semiahmoo Bay, this two-story prefab home was designed for an active family and smart, efficient living. 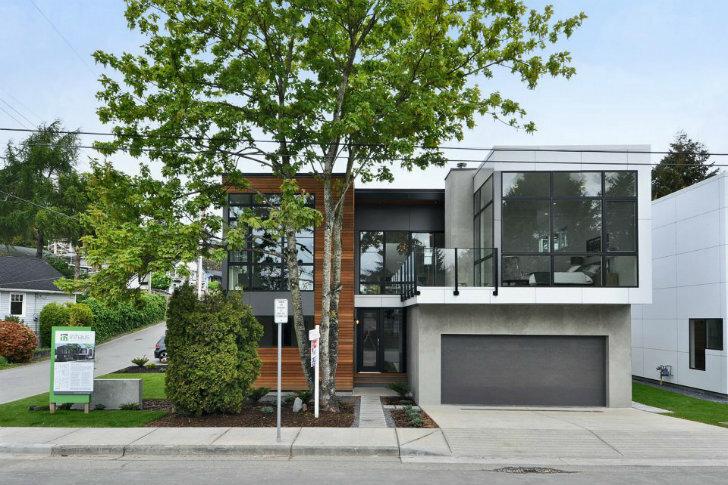 The home was designed by Seattle-based Pb Elemental, developed by South Surrey firm InHaus Development and built by Method Homes. Beachaus I was inspired by homes in the ultra-exclusive beachfront communities found up and down the California coast, and it is the first certified LEED Platinum in the area. Beachaus I is a 2,085 sq ft home that includes a large separate office/studio space and bright shared spaces. The project was developed by InHaus Development, whose mission statement is to “Live smart, not large”. The home was created by Pb Elemental who exclusively designs for InHaus. This home features two bedrooms, utility space and a studio downstairs, with the shared living/kitchen/dining and master suite upstairs. A deck of the living room provides views out to the bay and lots of windows let in natural daylight and add to the views. Certified LEED Platinum, the home boasts a smart, energy-efficient design including, HRV air-exchange system, high performance windows, radiant hydronic heating, tight thermal envelope with high performance spray foam insulation. Rainwater is harvested from the roof and used to help irrigate the xeriscaped, low-maintenance yard. Inside, the home features bamboo flooring, FSC certified cabinetry, and water efficient fixtures. Beachaus I is a 2,085 sq ft home that includes a large separate office/studio space and bright shared spaces. The project was developed by InHaus Development, whose mission statement is to “Live smart, not large”. The home was designed by Pb Elemental who exclusively designs for InHaus. This home features two bedrooms, utility space and a studio downstairs, with the shared living/kitchen/dining and master suite upstairs. A deck of the living room provides views out to the bay and lots of windows let in natural daylight and add to the views. Certified LEED Platinum, the home boasts a smart, energy-efficient design including, HRV air-exchange system, high performance windows, radiant hydronic heating, tight thermal envelope with high performance spray foam insulation. Rainwater is harvested from the roof and used to help irrigate the xeriscaped, low-maintenance yard. Inside, the home features bamboo flooring, FSC certified cabinetry, and water efficient fixtures. Natural daylighting, ventilation and views round out the home's performance. Setting in the modular units.